Hi, Thea Green, here. I’m the librarian at the Blue Plum Public Library, and a character in the Haunted Yarn Shop Mysteries by Molly MacRae. I’m substitute blogging today for the characters from Denise Swanson’s Scumble River Mysteries and Devereaux’s Dime Store Mysteries. I substituted a couple of months ago, too, for Kath Rutledge, my friend who owns the titular haunted yarn shop. Librarians use words like “titular” because we’re cool. Another cool thing we do is “booktalk.” How does that work? Simple – a patron asks for a book recommendation, I ask a few insightful questions, and then I tell the patron about a few books she or he might enjoy. Allow me to demonstrate. Patron: I’m in the mood for a mystery. What’s good? Me: What do you like? Cozy? Noir? Police procedural? Hardboiled? Me: With knitting and a ghost? Set in Tennessee? Patron: Nah. Have you got anything set in the Midwest? Me: City or small town? Me: Maybe with a touch of romance? Me: Okay, then, have I got the series for you. Two series, in fact, and both by Denise Swanson. One is the Scumble River Mysteries, starring Skye Denison, a school psychologist who returns to the small town she thought she’d left behind for good. The other is Devereaux’s Dime Store Mysteries, about Dev Sinclair, a curvy woman – kind of like yours truly – who loves running her old-fashioned store in her small Missouri town, is tickled by the attention she’s receiving from three hunky men, but isn’t so keen on the murders . . .
Patron: Cool! I’ll check out the first one in each series, and if I like them, I’ll buy the rest and pass them around to my mom and sisters. Thanks, Thea! And that’s how booktalking works. That was practically a verbatim transcript of an actual patron encounter. Cool, huh? What about you? What kind of mysteries are you looking for? Feel free to ask me for a recommendation. Or stop by your own library and tell them Thea sent you. 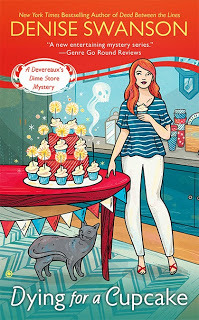 New York Times Bestselling author Denise Swanson writes the Scumble River mystery series, the Devereaux's Dime Store mystery series, and the Change of Heart romance series. Her most recent books are Murder of a Needled Knitter, Dying for a Cupcake, and Good Girl Overboard. Hooray for librarians and booksellers! Thank you, thank you, thank you very much (my Elvis is off this morning - summer reading is in full swing and we are crazy busy)! My absolute pleasure! I'm a total fan of your books! What would be do without our libraries and our librarians like you, Thea? I buy a lot of books but I also rely heavily on my local library, which is very tiny but connected to the all the other county libraries so reserving on line is so easy - and I've gotten a lot of good recommendations!